Memphis is without a doubt a basketball town. Residents of Memphis stand behind the Grizzlies and are extremely passionate about them... especially during playoffs. Everywhere you go you'll see 'Go Grizz' signs, fans wearing shirts, and you definitely see Growl Towels. 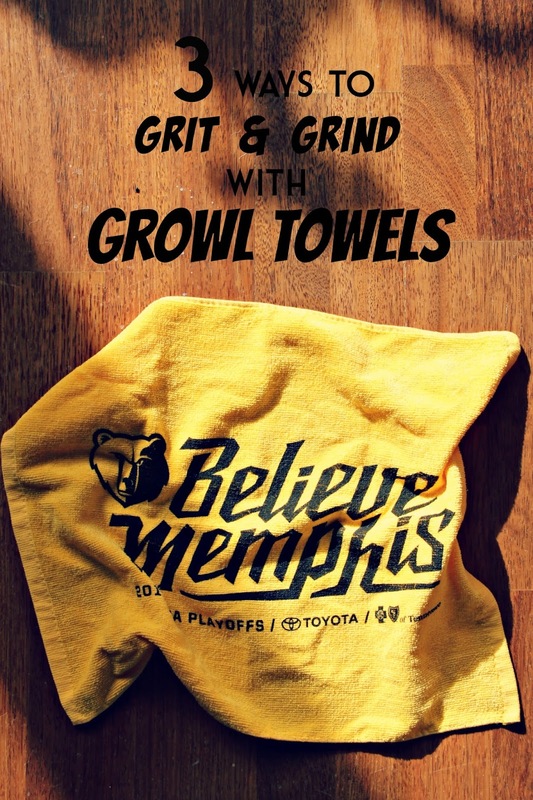 When you attend a home game during playoffs, you receive a Growl Towel to wave and cheer on the Grizzlies. When the game is over, what are you supposed to do with these towels? 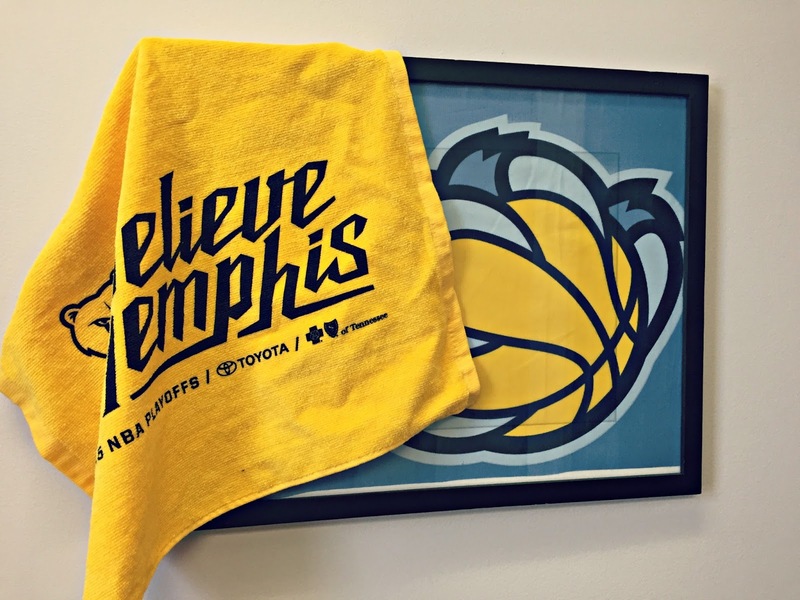 1 >> Decorate your office - You should absolutely Grit and Grind (aka be a huge Grizzlies fan) outside the Grindhouse (aka the FedEx Forum)... especially at work. You might as well use these yellow towels to brighten up your office or cube. 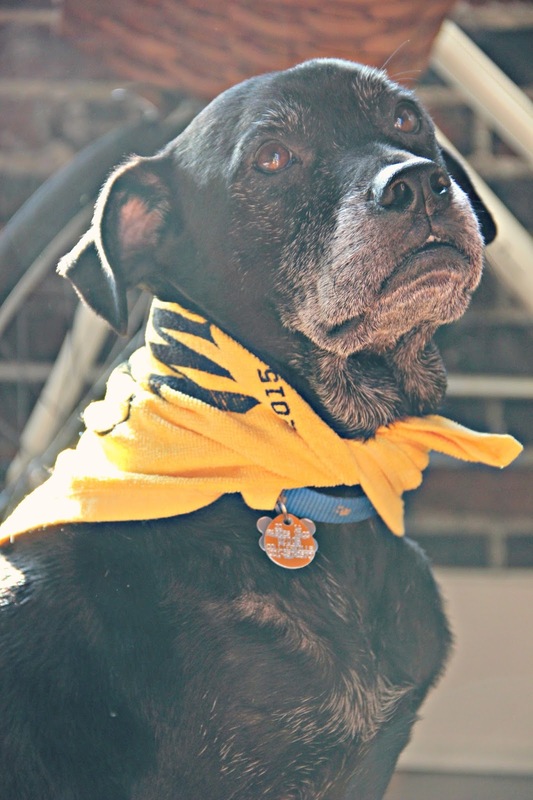 2 >> Decorate your pet - Our four legged friends can Grit and Grind, too! Harrison (pictured above) loves the Grizzlies, especially Bark Gasol (aka Marc Gasol.... yes, I went there). 3 >> Give them to a fan of the opposing team to wipe their tears - just kidding... but seriously, I guess we could send a few to Golden State. I've also seen people get extremely crafty with their Growl Towels. If you collect enough, you could make a blanket, or even sew two together and make a throw pillows! There was even a guy at a game wearing Growl Towel pants. Yes, pants. The possibilities are endless, but the essential thing is that it's definitely possible to Grit & Grind everywhere you go, and you should.